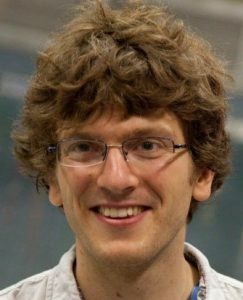 Jonas Peters, PhD, Associate Professor of Statistics, Department of Mathematical Sciences, University of Copenhagen (Denmark), “Invariance and Causality” at 11:00 am on Thursday, May 17, 2018, in Rooms 407A/B BAUM, 5607 Baum Blvd., the Offices at Baum. Abstract: Why are we interested in the causal structure of a process? In classical prediction tasks as regression, for example, it seems that no causal knowledge is required. In many situations, however, we want to understand how a system reacts under interventions, e.g., in gene knock-out experiments. Here, causal models become important because they are usually considered invariant under those changes. A causal prediction uses only direct causes of the target variable as predictors; it remains valid even if we intervene on predictor variables or change the whole experimental setting. In this talk, we show how we can exploit this invariance principle to estimate causal structure from data. We apply the methodology to data sets from biology, epidemiology, and finance. Biography: Before joining MATH/Copenhagen, Dr. Peters has been leading the causality group at the Max Planck Institute for Intelligent Systems, Tübingen. Before that, he was a Marie Curie fellow at the Seminar for Statistics, ETH Zurich. Dr. Jonas studied mathematics in Heidelberg and Cambridge and did his PhD with B. Schölkopf, D. Janzing and P. Bühlmann. His thesis received the ETH medal. He has worked with L. Bottou at Microsoft Research Redmond (WA, USA), M. Wainwright at UC Berkeley (CA, USA) and Peter Spirtes at CMU (PA, USA). His research focuses mainly on causal inference: we try to learn causal structures either from purely observational data or from a combination of observational and interventional data. We therefore develop both theory and methodology. Our work relates to areas like high-dimensional statistics, computational statistics or graphical models. It’s an exciting research area with lots of open questions! If you need to join the CCD Colloquium remotely, please follow the instructions below. DBMI has invited you to a video meeting. Just want to dial in on your phone? Want to test your video connection?